BRUNO was born at Cologne, about 1030, of an illustrious family. He was endowed with rare natural gifts, which he cultivated with care at Paris. He became canon of Cologne, and then of Rheims, where he had the direction of theological studies. On the death of the bishop the see fell for a time into evil hands, and Bruno retired with a few friends into the country. There he resolved to forsake the world, and to live a life of retirement and penance. With six companions he applied to Hugh, Bishop of Grenoble, who led them into a wild solitude called the Chartreuse. There they lived in poverty, self-denial, and silence, each apart in his own cell, meeting only for the worship of God, and employing themselves in copying books. 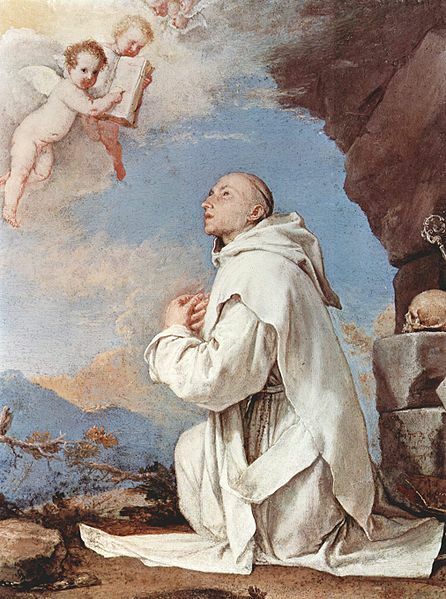 From the name of the site the Order of St. Bruno was called the Carthusian. Six years later, Urban II called Bruno to Rome, that he might avail himself of his guidance. Bruno tried to live there as he had lived in the desert; but the echoes of the great city disturbed his solitude, and, after refusing high dignities, he wrung from the Pope permission to resume his monastic life in Calabria. There he lived, in humility and mortification and great peace, till his blessed death in 1101.